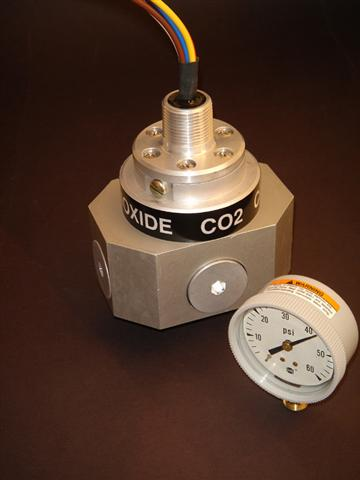 A new sophisticated new gas analyzer that measures carbon dioxide (CO2) under pressure extremes has been developed by Sensor Electronics of Minneapolis. Because of intermolecular energy transfer between EtO and CO2 (and nitrogen, oxygen, H20) under pressures, accurate CO2 measurement is virtually impossible. Unlike erratic readings with conventional CO2 detectors, this new analyzer ignores the transient extremes to give precise CO2 measurements through the cycle. The analyzer uses twin source –to-sensor pulsating infrared beams, thus eliminating mirrors/lenses/splitters, and problems with dust, dirt, condensation, contamination and misalignment. It also shrugs off temperature and humidity extremes. Self-correcting circuitry means the analyzer can work for years with-out fussy adjustment or recalibration. The analyzer even keeps a watchful eye on itself, flashing immediate warning of any internal problems, then spelling out what’s wrong where. The unit can link up with printers, plotters, loggers, computers to make a permanent record of fast-changing CO2 values. Additional information about this new analyzer that “sees” actual CO2 levels under pressure extremes is available from sales@sensorelectronics.com. 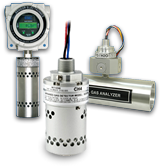 Sensor Electronics has many other gas detection products available – see our website at www.sensorelectronics.com or call us at 1-800-285-3651 for more information.